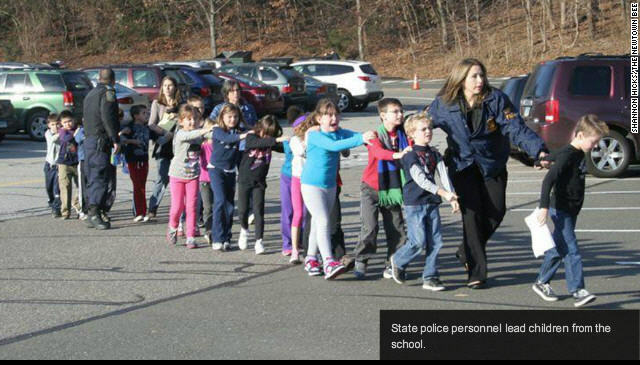 The official death toll is still not known, but sources say close to 30 people were shot today at Sandy Hook Elementary School in Newtown, Connecticut. CNN is reporting that 18-20 children have been killed. Pictures are streaming in of crying, terrified children, horrified, anxious parents, and eager, excited reporters, all flooded around the school. Not much is known yet about the shooter. The shooter was said to be young, between 20-24, with a mother who was a teacher at the school. The shooter may have been falsely identified as this man, who social media reports seem to prove is not the deceased suspect. At this point there is very little we definitively know about the shooter or victims. But there is one thing we know. He was a shooter. He used multiple guns to mass murder children. Almost as soon as reports came out about the horrific tragedy, people were pleading that this was not the “day or time” for talks about gun control. That to “politicize” this tragedy would be crass and distasteful, disrespectful to the victims. What would be disrespectful to the victims is acting as if this tragedy could not have been prevented. There is no way to stop evil, or mentally ill people from carrying on horrific acts. But there IS a way to remove the most ultimately destructive tools from their hands. There IS a way to prevent mass, large scale tragedy, perpetrated by one individual. Many have pointed to the attack in China today, of 22 school children, as proof that we shouldn’t be talking about guns at all. These 22 school children were stabbed, or slashed. They are going to need love, counseling, and the support of people around them, for the vicious violence perpetuated against them by a mentally ill violent man. But these 22 children are still ALIVE. They are alive because the man who attacked them lived in a country with strict gun laws, and used a knife. Those kids will be able to be comforted by their parents tonight. The children from Sandy Hook will not. This is not about using a tragedy to “further a cause” I believe in. It’s about seeing a tragedy and wanting to do everything in my power to try and prevent another one. That’s why I immediately donated what I could to the Brady Campaign to Prevent Gun Violence. Not to bring attention to a political cause, but to bring attention to a cause that exists to prevent violence. Preventing violence is exactly what we need to be talking about right now. I sat at my computer today as the reports came in, horrified. I tried to proces what I was seeing, as my heart broke for those families facing unbelievable tragedy. I cried. I mourned. And at the same time, I felt led to act. To do something. To speak up so that no more children have to die, in their school, at the hands of a gunman. I do believe that tragedies like today’s CAN be prevented. Or, if not totally prevented, than at least decreased, to a much smaller number than the one we see today – 61. Since 1982, there have been at least 61 mass murders carried out with firearms across the country. – US States with stricter gun control laws have fewer deaths from gun-related violence. – Japan, which has both incredibly strict gun control laws, and the second-lowest murder rate in the world, had 11 gun related homicides in 2008. The US had over 12,000. –The rate of people killed by guns in the US is 19.5 times higher than similar high-income countries in the world. The US has the loosest gun control laws of all developed countries. These are a few facts, of many, that point to a truth all of us need to hear right now – something, anything, can be done to help prevent another tragedy like this from happening. We can’t prevent violence. We can’t prevent murder, or evil, or death at the hands of sick people determined to cause pain. But we can use this tragedy as a wake-up call to discuss, act, and work hard to try and remove easy access to tools that lead to mass acts of evil. No more children should die at the hands of a gun that was easily acquired by someone who never should have possessed one. We need to mourn. We need to pray for these children’s families, friends, teachers, and classmates. But we also need to act. These victims of gun violence agree. We should listen to them. They’ve experienced something that no more children should have to endure.